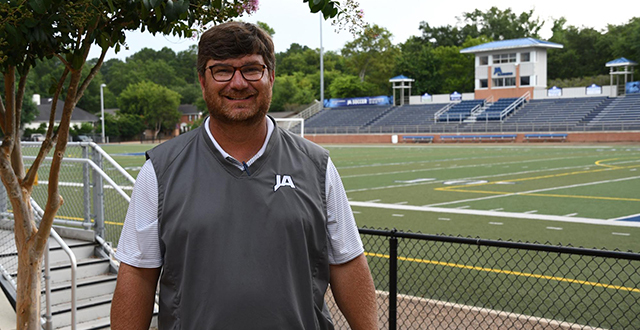 Jackson Academy is happy to welcome Coach Brandt Walker as associate athletic director. In addition to his associate director role, Walker is the defensive coordinator for the Junior High football team and assists with Varsity football and the boys and girls track teams. Walker comes to JA with 14 years of coaching experience, including a decade as football and track coach at Jackson Prep. As he begins his new role, Walker intends to highlight the Athletic Department’s existing strengths. Part of his job is keeping up with logistics such as ticket sales, player eligibility, and the athletic calendar. Of Walker’s plans, the one that brings the most excitement to his voice is his plan to elevate the fan experience. When he describes Fridays at JA, you can feel fall football in the air. “I love Fridays during football season,” he explained. “It’s an experience unlike any other. Going to pep rallies and then after three o’clock when school is out and they are starting to cook the hamburgers in the concession stand..the music is going…it’s the greatest time of year.” That tangible excitement is what Walker hopes to ignite in others by promoting athletics through social media and collaboration with the Raider Network, an internet broadcast that highlights student achievements in athletics and arts while exposing students to the latest opportunities in broadcasting and production. someone’s wedding and a former player approaches you and shares how they are sorry for the stupid things they did when you coached them, apologizing for the way they acted, and then they say thank you. You can’t put money on that. Those experiences are awesome.” He is also proud when he sees his former players thriving in their careers. “Those moments where you see their success is truly what it is all about,” he said. 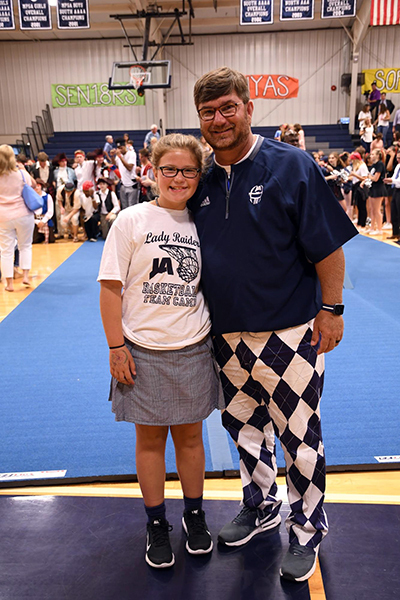 Walker is married to Jennifer, the director of professional development at the Mississippi Department of Child Protection Services, and their daughter, Mary Hampton, is a sixth grader at JA.